A Citi Bike station in Manhattan. ASTORIA — Citi Bike is slated to roll out in the neighborhood as early as September, the bike-sharing service said this week. Though an official launch date has not been set, the bike stations are set to arrive in Astoria in late September or early October, according to a tweet from Citi Bike's official Twitter account. Late September/Early October! We don't have official dates yet, but promise to release them as soon as we do! A Department of Transportation spokesman confirmed that the Astoria expansion is planned for late summer, noting that the timeline is subject to change. 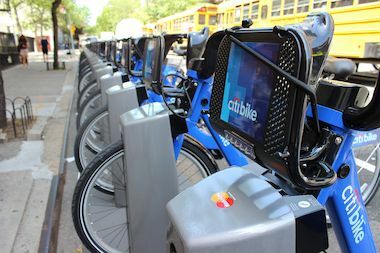 The neighborhood is one of several new areas slated to get the bike-share service by the end this year, more than doubling the number of Citi Bike stations citywide, according to an announcement in 2014. Astoria will be only the second location in Queens to get Citi Bike, which has been operating in Long Island City since 2015. Earlier this spring, the DOT proposed 59 locations for potential Citi Bike docking stations in Queens Community District 1, which is bounded by Ditmars Boulevard to the north, Queens Plaza North to the south, Vernon Boulevard to the west and 44th Street to the east, according to the plan. A DOT spokesman could not immediately confirm whether those would be the final station sites.